Last General Meeting of the Semester! 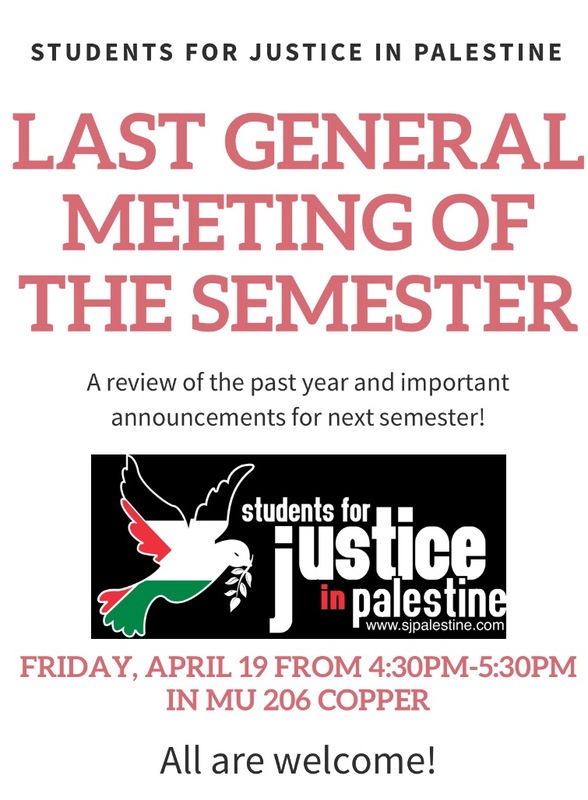 Our last general meeting of the semester! 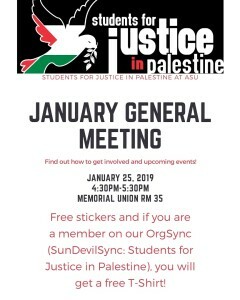 As always, free stickers and if you are a member on our OrgSync, free shirt! 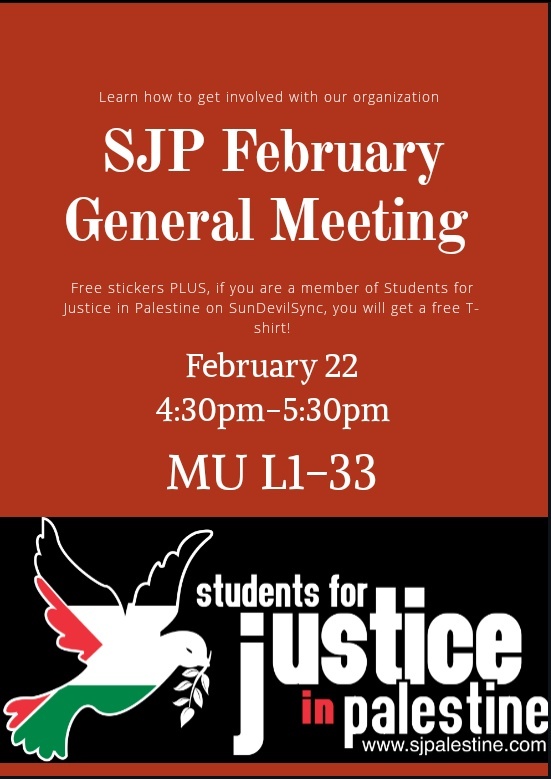 Our general meeting of the month is THIS FRIDAY! All are welcome! Our first meeting of the semester is tommorow! Hope to see y’all there! 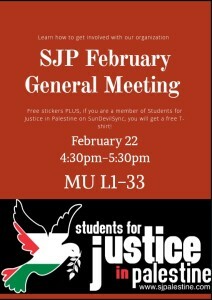 The officers at SJP heard and listened to your ideas. Due to popular demand, we will be tabling this month! Please fill out the link below by Sunday and we’ll see the best days for us to table. Thank you! Hello all! 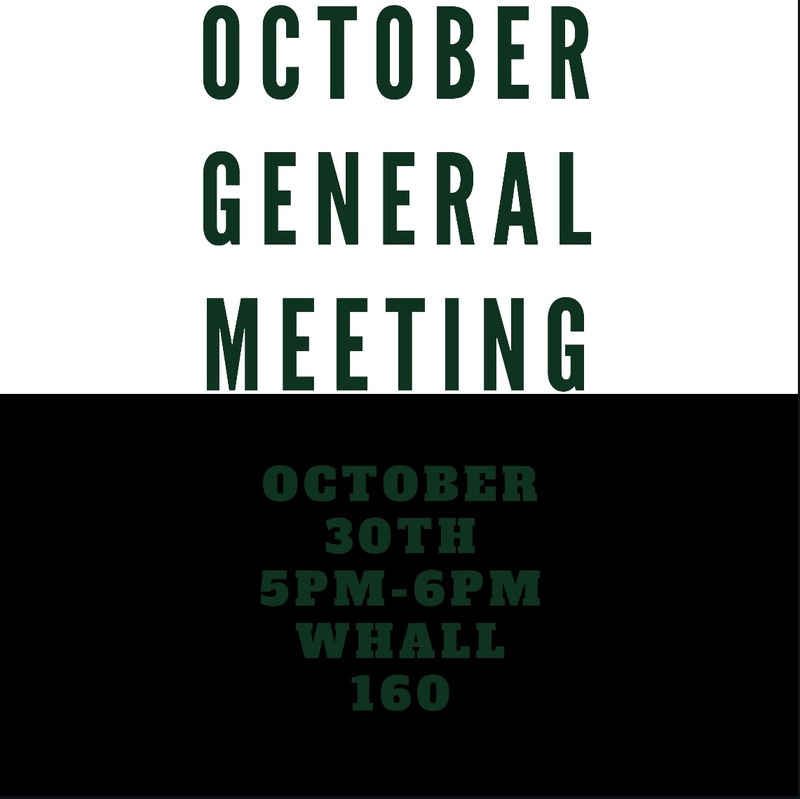 Our October general meeting is TODAY from 5pm-6pm in WHALL 160! Free stickers as alway Hope to see y’all there! Fundraiser for the Jerusalem Fund! We are having a fundraiser for The Jerusalem Fund next Saturday, November 3 from 5:30pm to 8:30pm at McAlister’s on Rural Road! 2. 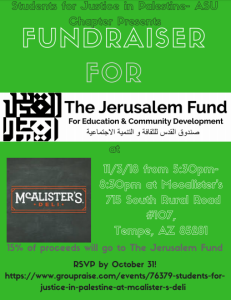 At the event, when your order, mention Students for Justice in Palestine, and McAlister’s will donate 15% of your meal price to The Jerusalem Fund! It’s that easy! Hope to see y’all there! We at SJP at ASU are absolutely devastated by the shooting in Pittsburgh today. We do not tolerate antisemitism or any sort of hate. We send our love and condolences to not only Pittsburgh, but to the worldwide Jewish community. First General Meeting of the Semester!